New cool feature from MetaVis: Discover site collections in Office 365 SharePoint 2013 environment. Office 365 does not have Central Administration console but it has Tenant Administration instead. Click on the Discover Site Collections button on the Connect to Site dialog and type tenant administration URL. Click Connect to login. The list of all site collections in the tenancy will be presented on the screen. Select one to copy, migrate, manage, analyze or backup. There are several interesting things that we plan to build on top of this new functionality but Discover Site Collections is the first one released. Stay tuned! MetaVis Tech builds tools for SharePoint Migration, SharePoint Backup, SharePoint Security, SharePoint Administration and Term Store Management and SharePoint Governance and PII Analysis. Recently we updated MetaVis Product Line (Architect, Migrator and Change Control and Release Manager) to be compatible with new Microsoft Office 365 hosted SharePoint environment. The result is a smooth integration with Office 365 SharePoint much in the style with the regular MetaVis functionality. 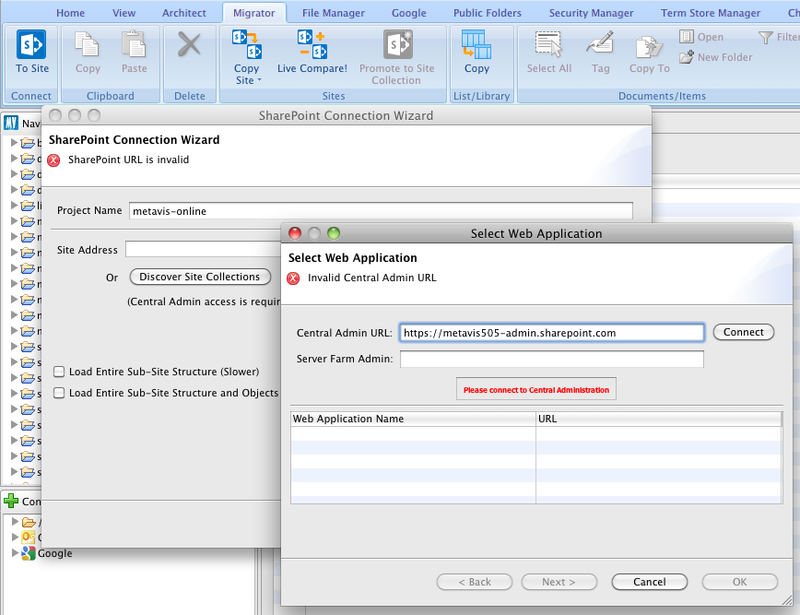 Connect to site dialog box requires URL to the hosted SharePoint site like it is displayed on the picture below. Connection is performed using Claims Based Authentication. The picture below demonstrates login with account hosted in Microsoft Online user directory. MetaVis Architect visualizes objects and their relationships. As usual, the diagram is editable and changes could be updated right into Office 365 SharePoint site. 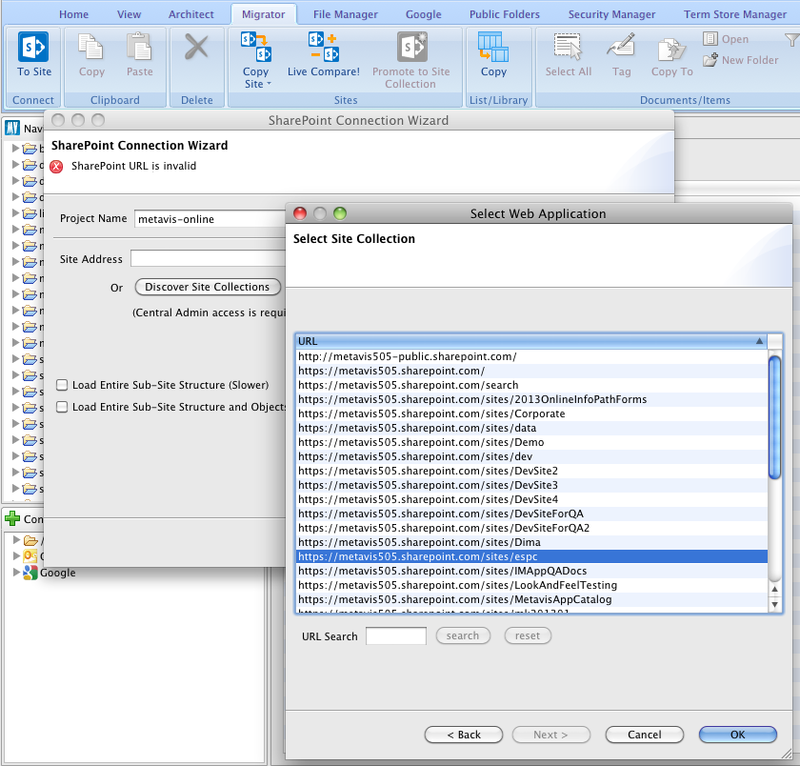 Connectivity to Office 365 SharePoint from MetaVis products is currently available as an optional module. Let us know if you are interested to check it out by writing us to sales@metavistech.com or submitting a request using Contact Us form so we can enable this functionality in your trial or permanent MetaVis License.